Jeff Gordon usually gets all of the accolades for the success of the Drive To End Hunger/DuPont Chevrolet. After all, he's the driver of the car. He's the one that race fans see on TV every week. However, he wouldn't come close to victory lane without a hard working team behind him. Led by crew chief Alan Gustafson and team manager Brian Whitesell, the Drive To End Hunger/DuPont team has a legendary history in NASCAR with four Cup series championships. The team isn't just made up of the pit crew that performs the lightning quick pit stops. It includes "the guys back at the shop" such as fabricators, engine specialists, chassis specialists, aerodynamicists, all the way down to the people that answer the phones. Alan Gustafson stepped into the crew chief position in November 2010 following a series of restructuring manuevers at Hendrick Motorsports. Gustafson has served as crew chief for Kyle Busch, Mark Martin, and Casey Mears, among others. He has worked at Hendrick Motorsports since 1999 and recently signed a contract extension to keep him at HMS thru the 2014 season. 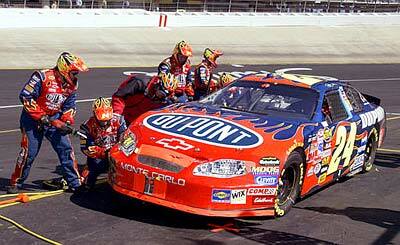 Jeff Gordon's pit crew has upped the ante on pit road since the inception of the "Rainbow Warriors" in 1993. The crew spends a few hours each week practicing pit stops. Thirteen second four tire changes are the norm with this group. In addition to the pit crew, other members of the team play invaluable roles during race weekend. From setting up the pit stall to calculating fuel mileage, these members play vital roles during the course of the weekend. Total 50-70 hours a week. 12-14 hours on raceday plus 4 hrs/week for practice in addition to their regular "shop" hours. Racing is a fraternity. It has become a common sight for members of a race team to work for several different teams over a short period of time. Jeff Gordon's team has historically been a tight group. There has been little turnover compared to the competition. Here's what a few former "Rainbow Warriors" have been up to since departing the organization in recent years. Steve Letarte Crew chief Crew chief for Dale Earnhardt Jr.
Ray Evernham Crew chief Track owner. Andy Papathanasiou Pit crew coach Ex. Dir., North Carolina Motorsports Assoc.